Construction of a palace to accommodate the Ottoman administration and royal household began in 1459, lasting most of the reign of Sultan Mehmed II. The palace included gardens reflecting the Muslim traditional love of nature and symbolic derivation connected with aspiration for gardens of paradise. Six years after he conquered Constantinople, Sultan Mehmed II (Al-Fatih) decided on the construction of a palace to accommodate the Ottoman administration and royal household. The construction work began in 1459 and lasted most of his reign. The palace was made into a complex consisting of a number of buildings, courtyards and gardens. Gardens of geometrical designs of flower and vegetable beds combined with fountains and pools reflect the Muslim traditional love of nature and symbolic derivation connected with aspiration for gardens of paradise. Although the Ottomans did not match the extensive gardening of Andalusian Spain, especially under the Nasrid dynasties, the Topkapi palace shows a considerable talent and royal interest in it. Terrace gardens arranged in rows of cypresses stretch in many parts of the palace complex, especially along the sea shore. The palace was subject to many expansions, additions and modifications carried out by successive Ottoman rulers. As it stands today, the complex is organised in four courtyards consists mainly of three groups of buildings. The first courtyard lays in front of the palace and has no architectural interest. The second courtyard is an intermediary area separating between the throne, the Royal quarter and the outside world. It accommodates mainly the army barracks, halls, stables and kitchens. The latter consist of ten domed units, each one having a chimney and a ventilator over the cooking area. In the northern corner of this courtyard there are domed offices of the divan. This is an administrative quarter served as the judiciary council of the sultan and it is here where the viziers held their meeting and discussions. Proceeding from this courtyard through the Gate of Felicity one finds the third courtyard. This area is the most architecturally rich as it accommodates the royal administration and residence. At the centre there is the throne room "The Hunkar Sofasi" built by Selim I, and behind it there is Sultan Ahmet III library. The throne room was built in the 17th century as an audience hall filled with splendour and luxurious ornamentation, furniture and decor. The hall is a large rectangular salon covered with tiles and decorations most of which have been redesigned with Rococo decor. It is here that the throne sofa was laid and where the Sultan received embassies and foreign messengers. The northern wing of the courtyard is occupied by the palace school and its mosque as well as quarters of students. Towards the northern corner of the courtyard there are four domed rooms, three of which accommodate the relics of the Prophet Muhammed (puh) and his companions. It is reported that Sultan Selim I brought these objects from the east after his victory against the Mamluks in Egypt in 1517 and took control of Makkah and Medina, they became custodians of these relics. Selim was a zealous leader who felt strong attachment to these items and decided to safeguard them at the palace. One room, known as "Hirka-i Saadet Dairesi", accommodates relics including some hair of Prophet Mohammed (puh), his footprint and the copy of the Holy Quran that Caliph Uthman had. There is also the cover of the black stone "Hacer-ul Esved" which is an original cornerstone of the Kaabah at Makkah. In a second room, left to the first, there is holy mantle of Prophet and his swords. Beyond the palace school towards the north lays the Harem quarter. This is the residence and venue of the Sultan household. The word "Hareem" mostly used in the west by orientalists to discredit Muslims of violent womanising. The real word comes from "Hurma" a singular form of hareem, meaning that the person in question (woman) holds the honour of her partner and relatives whether a husband, a father, a brother or any close relative. This title forbids her to have any relationship except through legal marriage. In this paper, the Hareem is applied to the household quarter of the palace. The palace household quarter comprises a number of courtyards, gardens, baths and rooms. The first courtyard of the hareem quarter is the Valide Court "Courtyard of Queen Mother" The Valide is the mother of the sultan reigned over the Harem and her son. The courtyard is beautifully decorated with tiles, which Goodwin though were brought from 17th century Vienna or Italy. Around this courtyard a number of apartments were arranged, mostly built after the second fire (1667), baths and an 18th century music room. Further north behind the Valide compound there are the extensions made by successive sultans, Murad III, Selim III and Osman III. The most notable of these buildings is the saloon of Murad III, the Has Oda (also known as Privy Chamber). Built in late 16th century (1574-95), probably by Sinan at the edge of the Valide compound, the saloon has a square shape covered with a pendentive dome decorated with beautiful arabesque and Arabic calligraphy in which the sura Al-Ikhlas (112) of the Quran is inscribed in a medallion at the centre of the dome. At the base of the dome another Quranic verse from the sura of the throne. The walls were adorned with tiles with arabesque and geometrical designs and calligraphic bands. From the Valide compound a wide corridor, known as the "Golden Road", which leads to another hareem court known as "Courtyard of the Black or the courtyard of Eunuchs", beautifully decorated with blue, white and green ceramic tiles. These Eunuchs were black servants whose role was to protect the hareem compound stopping intruders. The court contains the apartments, mosque and baths destined for the use of the Eunuchs. The fourth and last courtyard mostly is dominated by the Tulip Garden, which once were adored by the Sultan. It served as a royal park used for relaxation and entertainment. Hence, the buildings of this section of the palace had leisure functions, mostly in the form of kiosks and terraces. The so called "Sunnet Odasi", "the Circumcision Chamber" is a pavilion built in the midst of the tulip garden and renovated by Sultan Ibrahim (1640-1648). The pavilion consisted of a large hypostyle hall renowned for its magnificent tiles, dating back to 16th C, mostly from the great legacy of the Iznik blue and white tiles. The pavilion is a party centre where the royal children were circumcised according to the Islamic tradition which obliges all male children to undertake this custom. The circumcision procedure was carried out in a partying fashion with feasts of food, music and joy, a tradition which is still carried out in a large number of Muslim countries. Valide: comes from the Arabic word (Walidah) meaning mother. Goodwin Godfrey (1971), op.cit., p.324. Surah 112: Say: He is Allah, the One and Only; Allah, the Eternal, Absolute; He begetteth not, nor is He begotten; And there is none like unto Him. The above figure shows the throne room (17th century) showing the throne sofa and much of the Rococo decoration which was applied in the 18th century. Source: M.Hattstein & P.Delius (Eds. 2000), 'Islam Art and Architecture', Konemann.p.564. 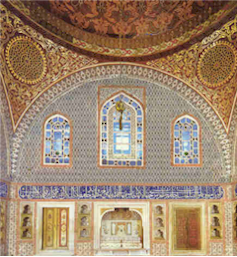 The second figure shows the salon of Sultan Murad III (late 16th century) showing the successful application of various decoration themes, calligraphy, arches, tiles, niches, windows, pendentives and dome in one surface.